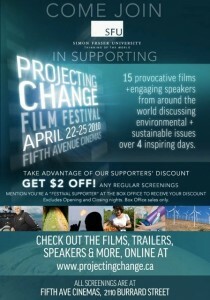 ACT’s Executive Director Deborah Harford will be speaking at the Projecting Change Film Festival. “The Great Squeeze: Surviving the Human Project” directed by Christophe Fauchere, will be playing at the Fifth Avenue Cinemas Saturday, April 24 at 2:30pm. For tickets and more information, visit the Projecting Change Film Festival Website here. Life on planet Earth is at a crossroads, with multiple environmental crises bearing down upon us simultaneously: climate change, resource depletion, oil supply decline, ocean pollution, overpopulation, species extinction, and more. THE GREAT SQUEEZE inventories and connects all of them, showing how short-sighted human behavior and decisions have resulted in a situation that threatens our lives and planet. Instead of the usual band-aid approaches, The Great Squeeze challenges us to learn from history and transition towards a more sustainable economy that values our environment. By changing our levels of consumption, deploying new technologies, and reordering social priorities, we can still live well. Renowned scientists, thinkers and authors, including Richard Heinberg, Edward O. Wilson, Lester Brown, Alexandra Cousteau, Jim White, Howard Kunstler and others, provide perspective and insights on our current state of affairs and how we can change course. Are we living in ‘The Age of Stupid’? Wake up, freak out, then get a GRIP!